Sapna Chaudhary did a volte-face on Sunday saying she hadn’t joined the Congress, hours after UP Congress chief Raj Babbar welcomed her to the party fold. 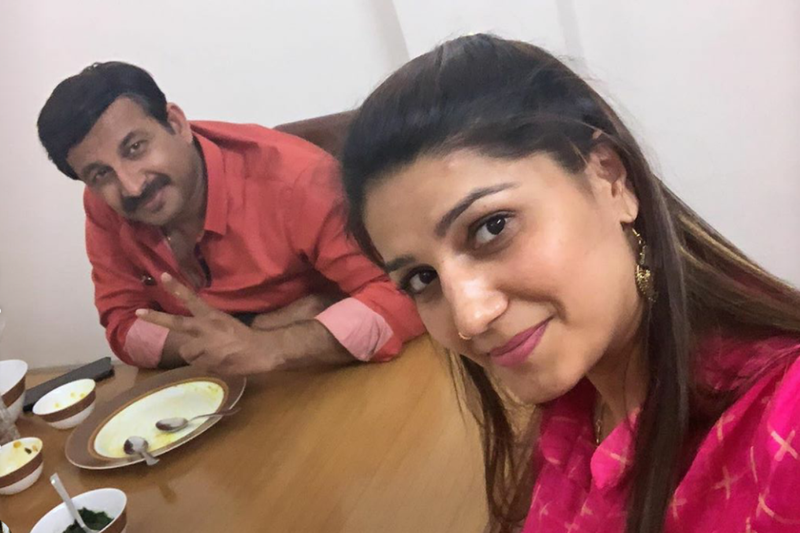 Sapna Choudhary, who did a volte-face after ‘joining’ the Congress party, met Delhi Bharatiya Janata Party chief Manoj Tiwari on Sunday. The popular Haryanvi performer also posted photos from the meeting on her Instagram account. Her meeting with Tiwari came hours after Uttar Pradesh Congress chief Raj Babbar welcomed her into the party fold and her claim that she had not joined the Congress. Choudhary also accused the Congress of using her old pictures with Priyanka Gandhi Vadra in order to claim that she had joined the party. According to reports, Choudhary wore the same pink dress she wore to the press conference on Sunday evening where she denied having joined the grand old party. When confronted by reporters about her pictures filling up forms of Congress membership, Choudhary said that old pictures can be passed off as new. Babbar had Saturday night welcomed Choudhary into the party and posted a picture on Twitter of the dancer with Congress general secretary in-charge of east Uttar Pradesh Priyanka Gandhi Vadra. “I welcome Sapna Chaudhary ji in the Congress family,” Babbar had tweeted on Saturday evening. Choudhary also said she will not campaign for any political party in the Lok Sabha election. “I have not joined the Congress party. My pictures with Priyanka Gandhi are old, as I have met her many times in the past. These pictures are old. The biggest issue is that I have not joined any party,” she told reporters. But the person who was photographed with Choudhary on Saturday evening displayed the membership form which she had apparently signed. On Monday, Manoj Tiwari told ANI that he did meet Sapna. “Yes, I met Sapna yesterday. In her press conference, she clearly said that she hasn’t joined the Congress and she won’t be campaigning for the party. We want to make Narendra Modi ji the Prime Minister again. I will be happy if Sapna Choudhary campaigns for the BJP in future,” Tiwari said. He also accused the Congress of using the performer’s picture without her consent. “Congress has used her old pictures to spread the news that she has joined the party and will contest from Mathura. She is the biggest superstar and Congress has stooped to such a low level. This was not expected of Priyanka Gandhi Vadra,” he added. Reports say that Choudhary was keen to contest from Mathura, where the BJP has fielded Bollywood actor Hema Malini. But the party has declared Mahesh Pathak as the candidate from Mathura in the eighth list of candidates for the Lok Sabha polls released Saturday night.